Open 7 days a week for lunch and dinner. Open at 11:00 am daily. 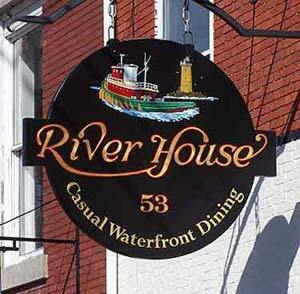 The River House offers casual waterfront dining year round. Dining options include a variety of space from one of our many tables outdoors that can be enjoyed in all seasons to our historical dining room and tavern. Cuisine includes choices ranging from award winning seafood chowder and lobster roll to marinated steak tips. Enjoy the history of the building, the view from the waterside tables and the cuisine served by one of the friendly waiters.